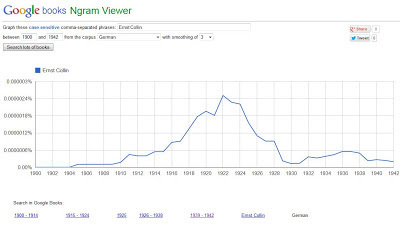 Today would have been Ernst Collin's 127th birthday. To honor him I am pleased to share the still rough and incomplete bibliography of his writings that I have been able to identify. While all in German (no translations available) they demonstrate how prolific he was in terms of his output and breadth of topics in the field of the book arts. His topics were technical and hands-on, reviews of exhibits, discussions of the state of the trade and art, the graphic arts in general and more. Often editorial in tone, his opinions were strong, yet constructive and forward thinking, and informed by his access to the best that German bookbinding, the trade organizations, and book/graphic arts had to offer. Well that, and his lineage – W(ilhelm) and Georg Collin court bookbinders to the Prussian Kings, German Emperors, and more. 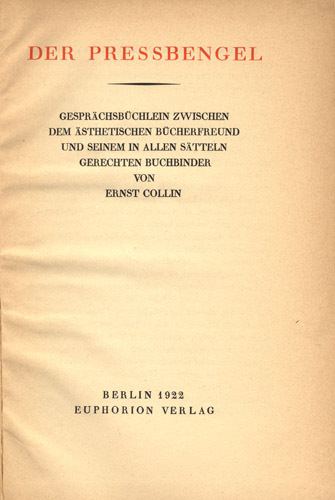 Ernst's most recognizable work was Der Pressbengel, translated into English as The Bone Folder by me and available via the links at left. The Google Ngram (Thank you Jeff Peachey) below visualizes his writings and provides links to many. 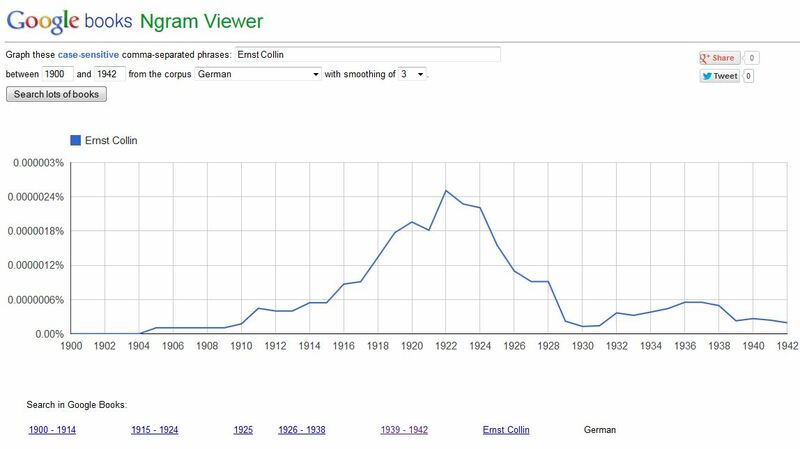 The Ngram is not perfect however as the other Ernst and writings mentioning "Ernst Collin" are also included in the visualization and links, but they do reflect his career as a writer. It also shows clearly that no matter how much I have been able to access, there is still more that I have not been able to find or access.In general the curve of the Ngram reflects the date range where I have been finding things. To access the bibliography with 82 titles including monographs, and articles click here. Of these, 39 are available via HathiTrust and other digital collections, hopefully also in the German-speaking countries that would benefit most from his writings. For those without (at least) a reading knowledge of German, Google Translate has gotten much better over the years, the OCR behind the indexing at HathiTrust is better than expected, and sense could be made of his writings. For the more technical terms consult the multi-lingual dictionary created by Suzy Morgan. Language and access will forever be challenges in all aspects of research, and there is still far more still only available in print and not digitally. Copyright will make it difficult to access the post 1922 writings, as do holes in the collection of HathiTrust, the archive for the books digitized by Google from items in libraries in the US, publications that haven't been digitized (or otherwise reformatted/preserved such as on microfilm), and losses due the war. Regardless, I will compile as complete a bibliography as is possible with the tools I have available, am deeply indebted to Syracuse University Library's inter-library loan department, and make as much available as I can. It will all however fit in between actually binding books, have some exhibitions goals for this year, and other projects.